In large mixing bowl, cream together butter, peanut butter, granulated sugar and brown sugar. Add one egg at a time, mixing well. Stir in milk and vanilla. In a separate bowl, combine flour, baking soda and salt. Stir into the peanut butter mixture a little at a time blending well. Shape dough into balls, roll in granulated sugar and place on ungreased cookie sheet. Bake for 10 minutes until slightly brown. 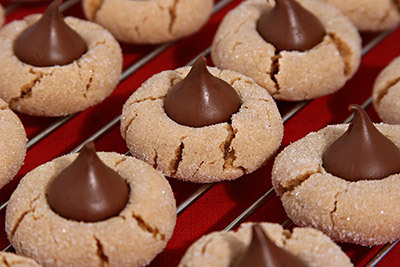 Remove from oven and immediately press a chocolate candy kiss into the center of each cookie.